HUNGARIANS AND THEIR NEIGHBORS “Bad neighbors – Turkish curse”, says an old Hungarian saying. During the one and a half thousand years Hungarians have spent in the Carpathian Basin they have had ample time to experience the truth of this saying, as have their neighbors. Of course it would be an exaggeration to call all neighbors “bad”: centuries of central Europe’s mutual past are just as full of uplifting successes as they are of historical tragedies. They are centuries of glory, eras of building, and centuries of oppression. As for the neighbors, Hungary has been a “in the middle”, caught between two great powers, ever since Saint István founded the state. The country enjoyed the advantages of this position, but also experienced its destructive disadvantages. Hungary was always in a zone of peripheral neighbors. During the time of Hungary’s first king, eastern and western Christianity, Rome and Byzantium, were gradually separating and represented the two opposite ends of the spectrum. Translated into terms of power, Hungary was caught between the Holy Roman Empire and Byzantium. Beginning with the foundation of the state and the simultaneous adoption of Christianity in the Middle Ages, Hungary became a borderland between the East and the West, or to be more specific the eastern border of the western world, the “Latin Globus”. The eastern border of the Kingdom of Hungary was at the same time the eastern border of Western Europe, or “the West”. This is how Hungary became, much the same as Poland, the shield and ramparts of Christianity, for centuries, the “antemurale christianitatis”. The first assaults of the eastern conquerors reached Hungary’s borders first: that of the Tartars in the 13th century, followed by that of the Ottoman Empire in the 14th. By the 16th century the country was divided into three parts: the western third fell under the rule of the Habsburg House, while the eastern third, Transylvania, enjoyed relative independence while paying taxes to the Turks. “Between two pagans, for one homeland,” as a folksong of the time describes. In the 19th century this position of being between the east and the west took on new meaning. To the west of Hungary German unity was fast being formed, while to the east the empire of the Russian Czar, the “colossus of the north”, was stretching towards Central Europe. On one hand the Habsburg Empire prevented Hungary from developing national independence, but on the other hand it created a balance of power in the region. With the break-up of the Austro-Hungarian Monarchy at the end of World War I, several smaller and larger states were created which made the region extremely vulnerable to the totalitarian powers, the German Empire and the Soviet Union, gaining strength during the 1930’s. Following World War II Hungary once again became a border country, namely the western border of Soviet influence, somewhat reminiscent of the time of Turkish occupation. Depending on the shifts of history, Germans, and Austrians, were Hungary’s partners, aiding Hungary in its process of integration into Europe, while at other times they were the oppressors of Hungary’s freedom. In the centuries-old tradition of the Hungarian struggle for freedom Vienna and the Habsburg House are the repugnant image of the restriction of Hungarian independence. However, living side by side as neighbors is also responsible for the creation of a more jovial image, that of the “Austrian brother-in-law”. The judgment of Austrians has taken a positive turn over the last few decades. The era of communism played a large role in this, for the free world began in Austria at that time. It was also the path of flight after the Revolution of 1956, and the Austrians demonstrated great hospitality then. Hungary’s neighbors can also be grouped according to which peoples lived together with the Hungarians in the old country, and who were the neighbors of the Kingdom of Hungary. 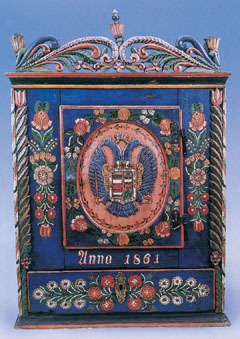 In the history of European neighborliness a rare example is the relationship between the Hungarians and the Polish. Each people, on their respective side of the border, maintained a positive opinion of the other for over a thousand years. There is even an old saying which states: “Hungarian and Polish, true brothers”. They had mutual kings and mutual fights for freedom. 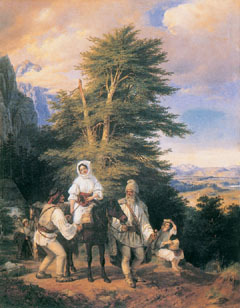 For centuries the Carpathian Mountains was both the border between two good neighbors and the path of escape: fugitives from both nations hid in its forests, if destiny so required it. Provinces of the historical Czech Kingdom also bordered Hungary. Since national endeavors were often in conflict during the course of the 19th century, public opinion developed accordingly: in Hungarian if something is “going czechish”, it means things are not going well. Similarly, in Czech “speaking Hungarian” mean the same a talking gibberish. During the era of communism and Soviet oppression, however, the image these two nations had of each other softened. Today, Czechs and Hungarians approach each other in friendship and benevolence. In 1102, in the Adriatic town of Tengerfehérvár, the crown of Croatia was placed on the head of Kálmán Könyves, marking the beginning of a union between Hungary and Croatia. This relationship of co-habitation, unique in all of Europe, lasted more than 800 years and was characterized by mutual interests and mutual battles. A true symbol of this concord were the Zrinyi brothers: Miklós Zrínyi and Péter Zrínyi. The great Baroque epic, the Battle of Sziget, was written in Hungarian by Miklós and translated into Croatian by his younger brother Péter. 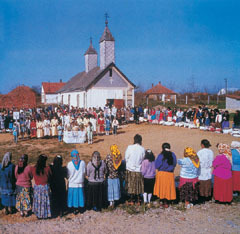 The harmonious relationship between the two peoples broke off during the course of becoming a nation, but many Hungarians and Croatians have attempted to recreate the community of faith since, and today Croatia considers Hungary its best neighbor. Another people living wholly within the inner circle of the Carpathian Mountains and so belonging to Hungary’s immediate neighborhood, are the Slovaks. They, too, were a part of the mutual homeland and up until the second half of the 19th century their identification with Hungary was strong. They participated in the Hungarian Revolution of 1848-49 in greater number than their national percentage. Their national movement of the 20th century, having not been able to achieve their rightful demands, popularized the idea of breaking away, which they were eventually able to do with international and Czech help. The new Republic of Slovakia finds it difficult to transgress 19th century nationalistic stereotypes and one time Slovakian grievances. Similarities in lifestyle and tradition will hopefully help dissolve these feelings in the future. 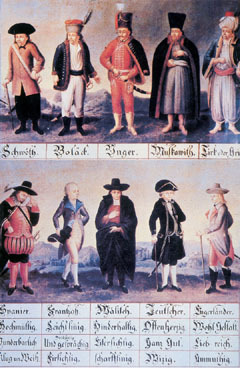 During the time of Rákóczi’s insurrection (1703-1711) conflict between Serbians and Hungarians were quite severe, since Serbians who had settled in Hungary sided with the Habsburgs, who had granted them various privileges. Both a “valiant” peoples, they were again on opposing sides during the Revolution of 1848-49, World War I, and in part World War II. Even so, there were memorable instances of cooperation as well. Hopefully, both nations, differing in mentality but similar in temperament, will be able to find more opportunity for agreement following the transformation of the Yugoslavian state. Hungarian and Rumanians live together in quite a large geographic area The area annexed to Rumania from Hungary in 1920 is larger than present day Hungary itself. The lifestyle and religion of the two peoples, however, is very different. Nation-state planning of the previous century could only be realized at each other’s expense: Transylvania had to be either Hungarian or Rumanian. The concept of the three major nationalities (Hungarian, Rumanian, German) living together as equals was most often rejected by whichever nation happened to be in power at the time. Ever since Rumania liberated itself from its dictator’s, Ceausescu’s, rule in 1990, it has maintained nation-state politics, albeit under different circumstances. Hopefully, Rumanian representatives of present day European mentality will be able to ensure Hungarians living within their borders equal rights. 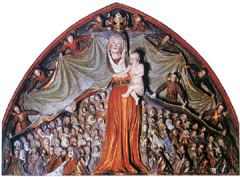 Rákóczi called the Ruthenians “gens fidelissima”, the most faithful of peoples. His observation was correct, for this ethnic group, living in the wooded ranges of the Carpathian Mountains, stood beside the Hungarians for centuries of both good and bad luck. According to a Ruthenian folktale God gave the flatlands to the Hungarians and the mountains to the Ruthenians. When it turned out that the two regions depend on each other, he made them promise to stick together: Hungarians should provide Ruthenians with wheat, and Ruthenians should provide Hungarians with wood. History, however, held a different fate in store. Ruthenians, and eastern Slavic peoples, were classified as Ukrainian and Russian by the Soviet power, and the decades of brainwashing left its mark: today only a small number consider themselves Ruthenian. The nation-concept. of the 19th and 20th centuries brought many a conflict, battle and misunderstanding with it in Hungary’s region of Europe. Neighbors considered each other enemies and spread this attitude in official propaganda. Some negative traits even found their way into textbooks. This negative heritage makes mutual understanding and acceptance difficult today. But there is also proof of change in some areas of negative characterization and prejudice: A majority of Hungarians today consider Austria a good neighbor, and the centuries-old anger of Hungarians at the one-time seat of power in Vienna has become a memory of the past. When the mounted statue of Jellasics, an important hero of Croatian national tradition, was raised again just recently on the main square of Zagreb, it was quickly turned around so that its sword would not point in the direction of Hungary, a friendly neighbor. Citizens of Croatia and Slovenia today consider Hungary a good neighbor and do not concentrate of the conflict of 1848, but on the figures of the Zrínyi brothers, and the helping hand Hungary offered during the last war of the 20th century.